*This is a sponsored post, but all opinions are my own. For full disclosure go here. 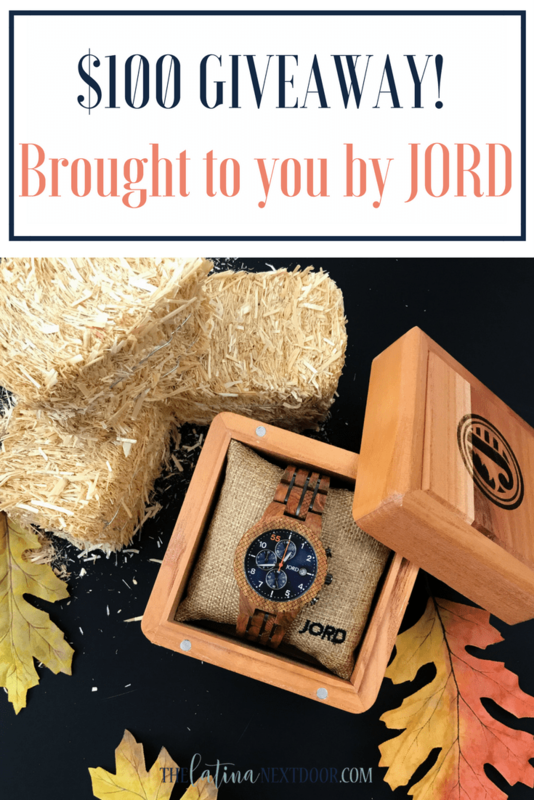 Get more details about the JORD Watch Giveaway below! Hello friends! The weather has been getting a little cooler here in Georgia and it has been a nice change. I’m still unpacking our things in the new home and am desperately looking for my fall décor. I don’t know about you but I love the holidays and look forward to them every year. There’s nothing like the sweet smell of apples and cinnamon, planning family dinners and of course shopping for those special gifts for Christmas. I truly enjoy going out and getting thoughtful gifts to those I love the most. Nothing makes me feel better than seeing my family’s faces when they open those unexpected gifts, which is why I wanted to share this amazing GIVEAWAY so that you too can give a special someone a gift they will cherish for years to come! I have partnered with JORD to give one of you the opportunity to win $100 E GIFT CODE toward the purchase of your very own JORD wood watch. And the best part is that everyone who enters will get a $25 E Code so everyone wins! My hubby has been working so hard during our move to the new home that it was so nice to be able to give him such a beautifully crafted and unique watch. Each JORD wood watch is made of 100% natural, hand finished wood. He has the Conway Series in Kosso & Midnight Blue and he appreciates how versatile it is. The Sapphire crystal glass allows for a more sophisticated look for work while the wood finish pairs easily with jeans and a sweater for an evening out on the town or a game of dominos with his buddies. No matter how you wear this chronograph watch it will definitely be a conversation starter! And one thing I really appreciate about JORD is their attention to detail from the product itself to the packaging. They mail these unique men’s watches in beautifully crafted wooden boxes as well and their shipping is prompt! You can imagine the look on my hubby’s face when I approached him with his unexpected gift! Now I am looking for a watch for myself since they also sell beautiful watches for women. He can’t have all the attention, right? Well, whether you want one for yourself or for a special person in your life, head on over right now for your chance to win $100 E Gift for one of the wooden watches! But you have to hurry cause you only have until September 17th to enter! So go now and GOOD LUCK! Beautiful photos! I’ve always wanted one of their watches, so I may have to go and enter. Thanks for the giveaway!! Thank you so much! My husband never thought he would be a hand model, ha! Good luck on the giveaway! They truly are great watches!